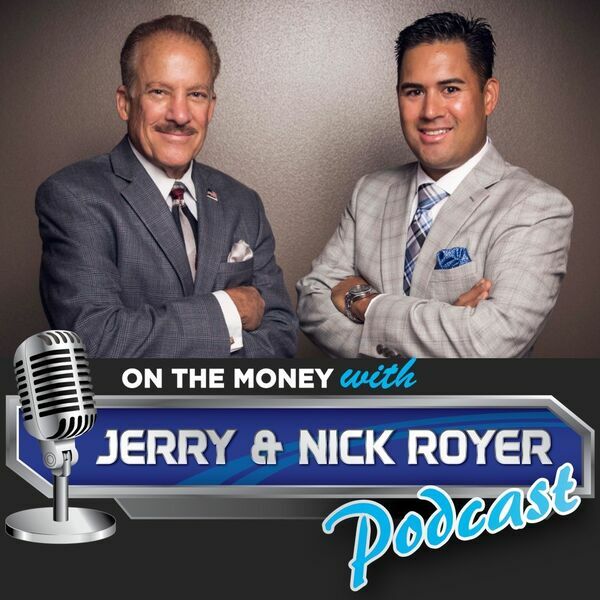 On The Money with Jerry and Nick Royer Podcast - Episode #17: Are Your IRAs, 401ks, and 403bs Ticking Tax Time Bombs Waiting To Go Off? In this weeks episode of the On The Money Podcast you'll find out how to tell if you are sitting on a Ticking Tax Time Bomb just waiting to go off! - Why your 401k, 403b, IRA, or other pre-tax investments could be your biggest tax liability. - How to figure out if you have taxable, tax-deferred, or tax-free investments. - 3 strategies to use to become more tax-efficient in retirement. - How to instantly move your money into the tax-free world. Speaker 1:0:01This is the on the money podcast with Jerry and Nick royer broadcasting nationwide. Jerry and nick are consumer advocates, authors and TV news contributors to NBC and ABC Stations. Their nationally syndicated radio show reaches coast to coast every week. Jerry and nick will show you how to make sure you live a confident retirement lifestyle with more simplicity at less worry. You are listening to the on the money podcast with Jerry and Nick Royer. Speaker 2:0:34This is the on the money podcast with Jerry and Nick Reuter, and if you don't already know by now, they are TV news contributors, radio show cohost, and the founders of group 10 financial. They use their over 70 years of combined experience and expertise in the financial and retirement industry to help educate you to get successfully to and through retirement. They've created the on the money. Five step retirement process, a system that helps you build a simple retirement blueprint for maximizing your retirement income, helps you smartly invest for any economy and helps you put it into paying unnecessary taxes. I'm mark Elliot and on the podcast today we're going to talk about taxes. There's three tax buckets. The jury, Nick, are going to talk about really when you think about what the goals of Jerry and nick always have for the people that they work with, a group, 10 financial is to help them keep more money in their pocket where it belongs and not in the government's pocket. Speaker 2:1:23So let's face it, a lot of Americans are investing in ways it's creating for them a ticking tax time bomb in retirement and what this means is that unknowingly a huge majority of people have invested in a way that may cause them to pay higher taxes in retirement than they even imagined just because of the way they invest in while they were working. So Jerry and nick, I mean, how can someone know if they're already paying way too much in taxes or they're on the cost of paying too much in taxes or they're all set and they're pretty tax efficient. Speaker 4:3:00to avoid as much of those taxes. You know, you guys do this day in and day out. Most of us don't work in this financial world. We have other jobs and other occupations. How in the world can we know maybe which investments are taxable? Which ones are tax deferred, which ones are tax free? And how do we move from left, right? And your tax buckets. How do we do that? Dad just said, you know, the perfect thing is imagine these three buckets you have the far left bucket is your taxable bucket and then your middle one's tax deferred and you're far one's tax free. So what you need to do is actually step one is to figure out what you have invested and then figure out which bucket it goes into and that's what will help you out with right now. So at first bucket taxable bucket, think about the taxable bucket is anything that goes in there is stuff that you get a 10, 99 or a w, two w two, and then that would be work income, work, income's taxable. Speaker 4:3:48In the investment world, what fits in that taxable bucket is 10 99 income. So cds you get interests from cds, that's taxable dividends, that's another one. Dividends from stocks and mutual funds and the like, those types of things. You're going to get a 10, 99. Look at that. Taxable bucket is something you're getting taxed on every year. Whether you use that money or not, we call it incredibly tax inefficient because you're getting taxed on money that you're possibly not even using it, taking it to your accountant every year and you're taking all these statements in that he adds up and figures out how much tax you're going to pay you. And I think that was the David Rockefeller jr saying, don't get taxed on money you are not using. Exactly. I said that would be the first one is you have to taxable bucket. Next one would be tax deferred. Speaker 4:4:37So the things that fit into a tax deferred bucket would be like qualified retirement plans, like an IRA, four zero, one k IRA, four zero, three B, 4:57, stuff like that. Or a nonqualified annuity. They a non IRA, it's not an IRA but through an insurance company. So it accumulates tax diethard that sooner or later you'll pay tax on the game, right? Exactly. So it grows tax deferred, you pay it later on, but it's not an IRA or anything like that. So that's the. That's the middle bucket. Your tax deferred buckets. Now you've got taxable bucket, you've got the tax deferred bucket, and then the tax free bucket, that's the one dad liked. So what goes into the tax free bucket? Well that's your Roth Iras and you've got to follow a certain criteria. You've got to wait five years and so forth. Then you have tax free municipal bonds and that always reminds me of the old shell game at a carnival, which basically is that you've got a municipal bond that is not taxable, but what you received from that, you have to add into your income to see how much tax you're gonna pay on your social security, so there's a little slight of hand there and then you've got life insurance which is tax free. Speaker 4:5:44That's what the big boys use. They've learned a long time ago, I can put money in here, discounted dollars and I can get it out on the underside tax free, and those are basically the only three items that we can't make anything else. Right? That is what it is, what it is, what it is. That's it. We can't just say, oh, this is tax free insurance and tax free municipal bonds and Rovs got over into the tax rate column because the big boys put up there and there's a bunch of these alternative options out there that can create more tax efficiency, I guess you could say. When it comes to retirement in, in even your retirement income can be more tax efficient by using the right strategies. So we found ways to overcome pain too much in taxes. So give us a call for your complimentary strategy session with us and we'll see if these alternatives may work for you. That number is 869. One three, three, seven to 869, 1:33 slash 72. Speaker 4:7:41from taxable to tax deferred tax free as quickly as you can because now your earnings are not going to be reported or have something you have to give back to Uncle Sam. So here's a couple quick strategies. Strategy Number One, a lot of people have loose cash. It's sitting in cds, money market accounts, checking accounts in the bank. Yeah, late what we call lazy assets, lazy assets because it's not paying them any interest and they're getting taxed on it. Any as at the same time, you know, 10, $99 on those cds, it creates taxable interest and you're getting taxed on it every year. You want to try and move that money to tax deferred or at even the tax free investments. So you either pay taxes later on or never. That's one strategy. Another strategy would be mutual funds or stocks. This creates ordinary dividends and capital gains tax deferred or tax free. Speaker 4:8:36So you either pay taxes later or better, still never. So yeah, so mutual funds and stocks, if it's not IRA money, lives in that taxable bucket, that first bucket, and you're getting all those things and that's, that's there's way better ways to do it, to move it down into the other buckets. And the last one here is, is to take your accounts, your four zero, one ks, Iras, four zero, three Bs and move those monies from pretax accounts to tax free accounts. What we call an IRA exit strategy. So think about this as if you were a farmer, would you rather pay the taxes on the seed or the harvest? Okay, I'd rather pay it on if my seed costs me a thousand bucks, I'd rather pay taxes on a thousand bucks, not what I grow that seed to, which is maybe $10,000 worth of corn. I'd rather pay taxes on the smaller amounts and so sometimes what you can do through an IRA exit strategy can move money forms from a qualified retirement plan over to the tax free bucket. Now, that does mean you have to pay taxes on that money right now, but heck, I'd rather pay taxes right now at current rates than pay taxes later on it. Who knows what tax rates will happen down the road. Speaker 3:9:45Yeah. What you need is a durable financial plan that works in any economy, no matter if taxes are low or if they go through the roof, no one once a retirement where they pay more in taxes than while they did when they were working in retirement. You want a durable plan that can weather any storm. We talk about this a lot on the show. The strategies that got you to retirement will not likely be the ones to get you through retirement. Usually be investments that you used to grow your wealth aren't the best or most suitable to produce a durable, dependable, reliable, tax efficient, consistent retirement income. Speaker 4:10:27So if you're one of the next 10 callers right now, we will help you create a customized, simple to follow step by step, turn key financial blueprint. There's no obligation, there's no cost for this initial review. If you have over $200,000 saved for retirement, first, we will put your current situation through our own proprietary stress tests. This is like a financial x ray that will tell us the problems you have, the hidden things you might not know about and what you can do about it, and what could happen to your money when the market goes down. Again. Next, we'll do a tax analysis to show you how you could possibly stop paying unnecessary taxes. And again, keep more of your money in your pocket where it should be. And finally, we'll create for you a durable retirement income plan to help give you the lifetime income you need so you can spend with confidence in retirement. So if you're tired of flying by the seat of your pants and you want to be 100 percent sure that you'll be able to retire, well then this is for you, but you have to be one of the next 10 callers and give us a call in the next 15 minutes.